Grass does have a role in our desert environment with proper care and appropriate irrigation. There are heat-tolerant and less thirsty varieties of turf for those who love that patch of green in their backyard retreat and for those with children and pets who play on the lawn. But it's hard to argue in favor of growing swaths of grass in the desert just for ornamental purposes. It doesn't make a lot of sense. The Phoenix area receives only 8 inches of rain a year on average and, like much of the West, Arizona is 15 years into a drought. Unless you have a good reason to have that grass, is it worth the time, energy, and money, and water? Most of us don’t have the time to spend mowing and pampering the lawn the way our parents did. Maybe the kids have grown and gone and the grass doesn’t have the same place in your life. Perhaps that patch of grass is beginning to try your patience. Or maybe you bought a house and not all the grass is really useful. With the right planning, grassy yards can become shady and colorful landscapes that use far less water any time of the year. If you’re on the fence about replacing it, your city may have some encouragement to offer. Seven AMWUA member cities decided, some as early as the 1980s, to offer water bill rebates or a check to encourage residents to give up on lawns and try desert landscapes. Since then, these rebates have directly helped to convert hundreds of acres of grass into low-water use plants and trees at homes, HOAs, apartment buildings, churches, schools, shopping malls and businesses. 1. In most cases, tearing out the grass isn’t enough. 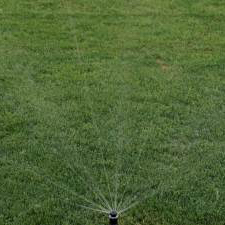 A property owner must replace the grass with low-water-use plants to earn the rebate. 2. No city requires that you give up all your grass. Plenty of homes and businesses include some grass in their desert landscape designs. 3. Not all cities offer rebates. It’s not because they don’t care, it’s because water conservation programs differ from city to city depending on the city’s age, size, demographics and neighborhood landscaping guidelines. Here is a summary of the turf-conversion rebates offered by AMWUA member cities. Glendale offers homeowners from $150 to $750 to remove from 500 square feet of turf to 4,500 square feet or more. The city offers commercial properties and HOAs $1,500 to participate in the city’s Water Budgeting Program and, then, $150 for every 1,000 square feet of grass removed up to 3,000 square feet. Tempe offers homeowners 25 cents for every 1 square foot of turf they remove. The city does not set a limit on the amount. The city offers commercial properties 25 cents per square foot up to $3,000. The city also offers commercial property owners $1 per linear foot, up to $500, to remove the hard-to-water grass between the curb and the sidewalk. Scottsdale offers homeowners 25-50 cents per square foot up to $1,500 to remove grass. Homeowners must remove a minimum of 500 square feet to qualify. The city also offers commercial properties 25 percent of the cost, up to $3,000, to remove grass and install city-approved low-water-use landscaping. Commercial property owners must remove a minimum of 1,000 square feet of turf. Avondale offers homeowners up to $400 for converting a high-water-use landscape to low-water use. The city offers up to $200 for a backyard conversion and up to $200 for the front yard. The city offers commercial properties and HOAs $200 per 1,000 square foot up to $3,000. Peoria offers homeowners and commercial customers from $90 to $1,650 to remove a minimum of 500 square feet of turf up to 5,000 square feet or more. The wide range of rebates offered depends on the amount of property covered with low-water trees and plants once the grass is removed. The higher the coverage, the higher the rebate. Mesa offers $500 to homeowners who remove 500 square feet or more of turf. The city can offer commercial properties and HOAs $5,000 if they remove 10,000 square feet or more of turf. Chandler offers homeowners and commercial customers $200 for every 1,000 square feet of turf removed up to a maximum of $3,000. The savings on your water bill doesn’t stop with the rebate. Research shows that an acre of desert-adapted landscaping uses about half the water that an acre of turf would use. That’s a big savings on your water bill every month. That also means each acre of turf converted to desert-adapted landscaping saves about 2.35 acre-feet of water, or enough to serve seven average Arizona households for a year. While that’s a lot of water saved, property owners who take advantage of these rebates set an example for their neighbors. With the cities’ encouragement these homeowners, HOAs, and businesses have helped to promote a culture of conservation and led many other property owners to embrace desert-adapted landscaping. And that preserves our precious water resources for future use.